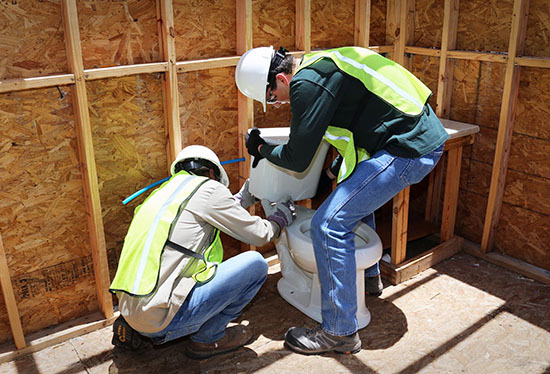 Offered in partnership with the Texas A&M Engineering Extension Service, Blinn’s 19-week Plumbing Program is designed to follow the National Center for Construction Education and Research (NCCER) curriculum. This nationally recognized curriculum was developed with the cooperation of more than 125 construction CEOs, trade association officials, and academic leaders. Students who complete these courses earn the NCCER certification, the Occupational Safety & Health Administration (OSHA) 10-hour card, and certificates from both Blinn College and TEEX. It also includes 200 contact hours of skills training and assessments covering basic safety; construction math, hand tools, power tools, construction drawings, basic rigging; introductory plumbing; plumbing tools; plumbing math; plumbing drawings; plastic pipe and fittings; copper tube and fittings; cast iron pipe and fittings; steel pipe and fittings; plumbing fixtures; drain, waste, and vent systems; and water distribution systems. The Plumbing Program includes a 10-hour construction training course covering OSHA standards, policies, and procedures in the construction industry. Topics include scope and application of the standards, construction safety and health principles, and special emphasis on those areas in construction which are most hazardous. According to the U.S. Bureau of Labor Statistics, the national demand for plumbers is expected to grow 16 percent between 2016 and 2026, generating 75,800 additional jobs with a median pay of $51,450 per year. Workforce Solutions Brazos Valley anticipates 25 percent growth locally during that same span, with an hourly wage between $12.01 and $36.23. Registration forms can be obtained at www.blinn.edu/workforce/pdf/student-registration-form.pdf and submitted to workforce@blinn.edu or in person at Blinn’s Post Office Campus located at 301 Post Office Street in Bryan. For questions or additional information, email workforce@blinn.edu or call 979-209-7205.